Clark Stoeckley, widely known as the WikiLeaks Truck Driver, is an artist and activist working in a broad range of genres and under numerous names. He received a BFA in Alternative Media from Webster University and an MFA in Performance and Interactive Media Art from Brooklyn College. His work has been shown at the Contemporary Museum St. Louis, Pratt Manhattan Gallery, Emily Harvey Gallery, and Plato’s Cave and featured in ARTnews, The Nation, and The Wall Street Journal. 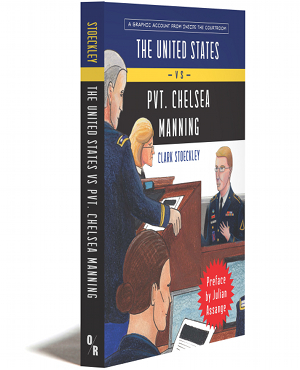 His courtroom sketches from Bradley Manning’s court martial have appeared in VICE Magazine and on FireDogLake. He teaches Experimental Digital and Analog Media, Painting, and Drawing at Bloomfield College in New Jersey.